Ceri Keeping is five foot eleven and, at just sixteen, wonders when she will stop growing. She feels like an enormous lump beside her dainty, elfin-featured adoptive mum. But that's only one of her problems. Mum doesn't seem to understand who Ceri is and what she really wants. She's trying make her a netball champion, while Ceri no longer enjoys netball and wants to focus on her desire to be a journalist. Ceri's younger brothers have a wild sense of humour which leads to humiliation on her birthday on a local radio show. And Dad is preoccupied - is he going to lose his teaching job and be forced to move his family away from their much-loved Welsh valleys home? One of Ceri's classmates, also adopted, has just met up with her birth mother for the first time since babyhood. Ceri wonders whether she should look for her birth mother, too. But when she sets out to investigate, employing her journalistic skills, she turns up worrying secrets that have been kept from her for years. 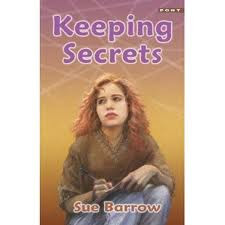 The cleverly named Keeping Secrets is a sensitive account of a girl who, while surrounded by a loving family, feels like an outsider and is determined to find a life and people of her own. Ceri is a well-drawn character and her family are entirely believable. I thoroughly enjoyed this book and am sure I'd have loved it as a teenager. I would strongly recommend it to anyone of about twelve and upwards, and I'd love to think there might be a sequel at some stage. The language is smooth and feels appropriate; the dialogue is convincing and I love the way that little bits of Welsh creep in (all translated for the benefit of non Welsh speakers like me). Keeping Secrets was published by a small Welsh publisher, Gomer Press, which perhaps explains why it has not become more widely known. It certainly deserves a bigger audience and I hope that a way may be found to make this possible. One small point of criticism, which I have a suspicion may not be the author's fault at all. There was a slight feeling of rushedness in the last couple of chapters. I'd have liked a bit more time to explore how Ceri felt about the denouement. I wonder whether this book was shortened at the publisher's request, or whether the author was writing to a word limit imposed by someone else. Whatever the reason, this is only a minor quibble. Congratulations, Sue Barrow, on creating a warm and realistic character, with whom it's very easy for the reader to identify, and a piece of YA fiction which should have wide appeal. Thanks for writing such an encouraging review Sheila. This was my first novel and on re-reading I agree that it could have been filled out a bit more in a number of places. I'm working on a sequel so there will be plenty of opportunity for Ceri to reflect a bit more on the shock discovery she makes at the end of the first book. Excellent! I will look out for the sequel.